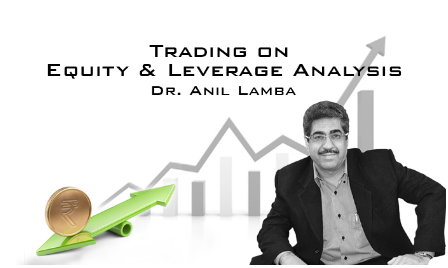 Trading on Equity & Leverage Analysis course is well crafted to make a student learn the financial tricks and strategies required to run a business successfully. This program intends to make a participant understand the tools and techniques required for assessing corporate performance, and also talks in details about the important and strategic issues faced in financial statements, sources of financing, etc. Trading on Equity module is an introduction to the principles of Marginal Costing. It begins with an example of the impact that the pattern of funding has on an organization’s profitability. It emphasizes on the need for business leaders and key executives to possess the ability to understand the firm's bottom line merely by knowing its top line, without waiting for accountants to tell them, and the technique to do so. Leverages, in the context of finance management, denote a disproportionate impact on the profit due to a certain change in sales. In this module, Dr. Lamba explains how fixed cost assets or funds can be used to magnify returns to owners, how to calculate the leverage multiple, and how to use Leverage Analysis to gauge the risk profile of any entity.